In this guide we’ll take a look at the best cordless irons. What Is The Best Cordless Iron? The Philips EasySpeed Plus Cordless Iron is the best cordless iron because it delivers on power and steam without the hassle of a cord. This 2400 watt cordless iron recharges in 6 seconds each time you put it back on the base plate, which obviously you do quite frequently when re-positioning clothes on the ironing board. This means you can iron continuously for as long as you want. The water tank holds 300ml of water so lasts ages before requiring a refill. The cordless iron also has a steam function and a steam boost button to help it glide through even tough and creased fabrics such as denim and linen. The Philips cordless iron has a neat and compact design making it easy to store. The ceramic soleplate makes ironing easier and prevents sticking. The iron also has a handy indicator light to let you know when it needs recharging. This is an easy and effective cordless iron to use, it never sticks or drips and is well worth the investment to save time and hassle. This is the best cordless iron to deliver on power and steam as well as being a compact and well-built product. The Philips EasySpeed Advanced Cordless Iron has a powerful steam function, a steam boost function, 300ml easy fill water tank and a ceramic soleplate all of which makes ironing easier. The cordless iron heats up in 30 seconds so there is no waiting around before you can begin ironing. The smart base has a colour change light to let you know when the iron needs recharging. The recharge takes just a few seconds, so this happens automatically each time you put the iron in the base to reposition clothes. This means you can keep ironing for as long as you need without waiting around for the iron to heat up. The iron also has a neat, compact design with a carry lock and a cord wrapping clip to keep everything in one place for storage. This cordless iron is compact, easy to store and really delivers on heat and steam without sticking or dripping. The Tower T22008 CeraGlide 2-in-1 Cord or Cordless Iron is a versatile product that can be used both corded and cordless, providing power and convenience. The 2400 watt power gives you plenty of heat and steam even in cordless operation and the ceramic soleplate glides over fabric with no sticking. This 2-in-1 cord or cordless steam iron offers the ultimate versatility allowing you to power through heavy ironing when you need to, but still have the versatility of a cordless iron when the corded one isn’t necessary. When used in cordless operation the iron heats up in 30 seconds and provides plenty of steam for most ironing jobs. This 2-in-1 steam iron is the best cordless iron if you are looking for one that can also be used corded for large amounts of ironing. The Russell Hobbs 23300 Freedom Cordless Iron has a steam function, vertical steam function for curtains and hanging garments and a powerful steam boost function meaning it powers through heavy creased fabrics with ease. This cordless iron heats up in 30 seconds and reheats in five seconds so it is always ready to use. The base has an indicator light to let you know when the iron needs recharging. The unit is compact in design and tidies away easily with its integrated cord storage. It also has a large 300ml water tank. This cordless iron offers power and versatility as well as being good value for money. It’s my top pick as the best cordless iron to buy on a budget! The Quest 35070 220 Degree Max Cordless Iron is another versatile product that can be used corded or cordless. It has a steam function, steam boost and easy to clean ceramic sole plate. When used in cordless mode, the iron is charged and ready to go in under 40 seconds and takes just 7-15 seconds to charge between uses. The base is a little larger than on the other products but still quite compact. This is another great budget choice for the best cordless iron as it provides significant power and steam as well as cordless functionality for an exceptionally low price. Ironing is not most people’s favourite job, so anything that can make it easier is a real bonus! One of the most significant choices you can make when choosing an iron is whether to go with a corded or cordless version. Both have their pros and cons and so this decision will largely depend on how much ironing you do and whether this is comprised of large and heavy fabrics or smaller, more delicate items. Another consideration is whether you are left or right handed. Several left handed friends of mine have commented that corded irons are even more of a hassle for left-handers! Obviously, the cord doesn’t get in the way of ironing. They are more manoeuvrable and versatile. For example, you can easily use a cordless iron to steam curtains while they are hanging, or to iron the bedsheets on the bed rather than wrestling tiny bits of them at a time onto your ironing board. They tend to be lightweight, which is handy if you have a lot of ironing to do or you struggle holding a heavier weight for a longer period of time. New technology means cordless models heat up faster than ever before so only need a few seconds to recharge and this happens naturally when you put the iron back onto its base to re-position clothes on the ironing board. They don’t cool down as you use them so don’t require recharging. This is handy if you are ironing large items such as sheets or you are a very fast ironer! If you try to do this kind of work with a cordless iron, you may have to stop every 30 seconds to recharge. They tend to have a higher steam output than cordless models. This means they steam powerfully through heavy to iron fabrics such as denim and linen. Even cheap corded irons have all the power you need, whereas you might need to splash out on a higher end cordless model to achieve the same results. Of course, there are also 2 in 1 irons available which can be used either corded or cordless and this could be the perfect solution if you do a mixture of heavy duty and light ironing. These will give you the versatility of a cordless iron with the option to stay plugged in for heavier duty ironing tasks. How do cordless irons work? Cordless irons sit on a base that has a cord and is plugged in. When placed on the base, the iron charges and heats up. Once you begin ironing you remove the iron from its base, and it begins to cool down. At some point, it will need to be put back on the base to reheat. This only takes seconds. For many people, doing general day to day ironing such as t-shirts and shirts this is fine. When ironing you automatically put the iron down every now and then to reposition the clothes on the ironing board. 2 in 1 type irons have a block attached to the cord and this block can either be inserted into the base section of the iron or into the charging base. 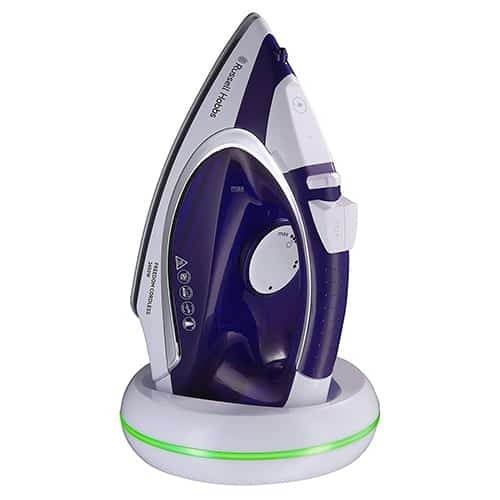 This makes it possible to use the iron either connected directly to the electricity or as a cordless iron.